November 25, 2012 November 25, 2012 ~ Craig M.
JACK is a new arts space in Brooklyn, an emptied-out storefront innocently tucked away in the hipster enclave of Willambsurg. Here, I got to experience an evening of aggressive noise. 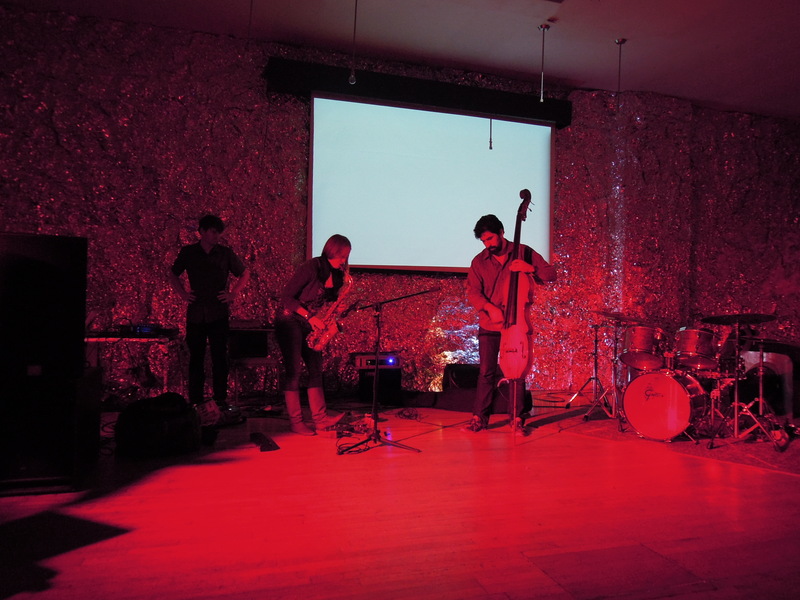 The intention was a CD release show for an improvising trio called Iron Dog, but the theme was aggressive noise, with three like-minded groups playing one long improvisation each. Mostly geared toward theater, JACK is an eclectic spot. It hosts Tuesday-night readings of French plays translated into English, for instance. 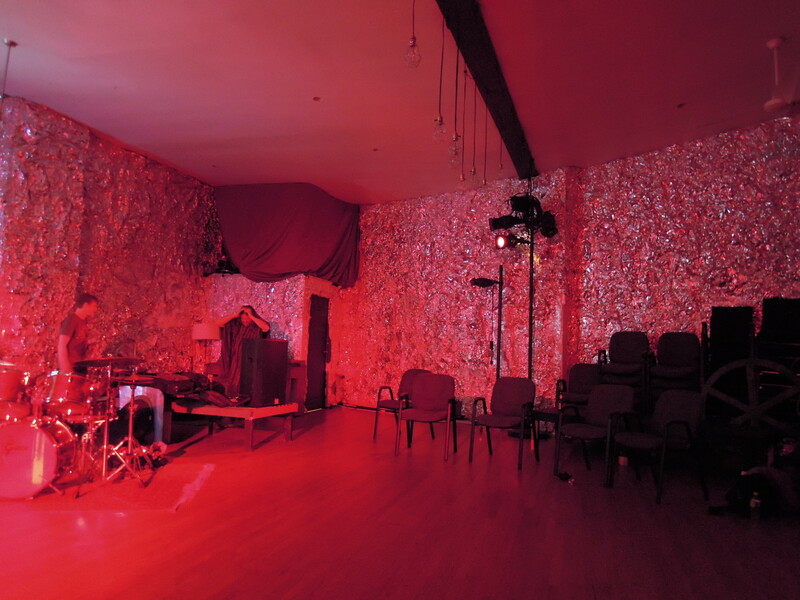 And it hosts experimental music, including occasional concerts titled Aural Dystopia — big, noisy improvisation. My friend Dan clued me in about the November installment, and I made plans to go get a taste. This was the same day as my Central Park tour, so after relocating my things to Brooklyn, where I would spend the night, I took a quick nap before heading into the subway. It wasn’t going to be a complicated trip, but it was still comforting to catch a glimpse of Jim Black — part of the night’s opening act — farther down the subway platform. At least I’d picked the right train. I arrived early with the intention of finding an espresso, which turned out to be a little tricky. Old Brooklyn still dominates the neighborhood; Starbucks hasn’t yet overrun the two or three blocks that I explored. I did find a hipster grocery boutique called Brooklyn Victory Garden that gladly sold me a coffee and a dinosaur cookie. You can’t turn down a dinosaur cookie. The show started with heavy saxophone blasts from Briggan Krauss, a choppy, ragged attack like a helicopter or a half-speed machine gun. That set the tone for the trio Han Blasts Panel, consisting of Krauss (sax, guitar), Curtis Hasselbring (trombone), and Jim Black (drums), with all three adding electronics of various shapes. We got to hear plenty of Black’s offbeat grooves, which start out tight and then unravel, as if slowing down (as I’d recently heard in his Nels Cline duo). Hasselbring sent the trombone through a variety of effects, and when he shut them off, the pure trombone sound suddenly felt bright and fresh. Black added electronics played off of a pad, including low, floor-rattling bass tones that worked especially well when Krauss was playing electric guitar. Towards the end, Krauss was riding a one-note groove, settling himself as the rhythm section while Hasselbring soloed and Black contributed those bass notes and some electronics crackles. When Krauss broke out of the groove, Black switched immediately back to drums, and the piece exploded into a new life. Great sequence. Next up was The Home of Easy Credit, the duo of Louise Dam Eckardt Jensen (sax, vocals) and Tom Blancarte (standup electric bass), who performed a set of sustained fury. They opened with Jensen playing smooth, mellifluous runs on sax, but Blancarte put a stop to that with a hard bass attack, using sticks and fingers to pull out loud, sticky notes, as if he were extracting teeth from the instrument. Jensen’s demonic growls were spooky enough, but it’s a moment of overdubbed syllables, a falsetto harpies’ chorus that she built up from loops and echoes, that’s going to turn up in my nightmares. Their set included some gorgeous cooldown segments (definitely in the minority) and some moments of mood-shifting that showed an attentive listening that’s the key to good improvisation. Then it was Iron Dog‘s turn, performing their piece in the dark accompanied by abstract video. Sarah Bernstein played violin and recited poetry for certain passages. Stuart Popejoy played electric bass, usually so heavily distorted and pedaled-up as to become a roar of electronics. Andrew Drury at the drum kit was a treat to watch; I loved his jazz-influenced drumming, but he spent a larger amount of time in a soundmaking space, bowing his cymbals and creating other scraped noises. Bernstein’s poems are written down, but she selects them on the fly, inserting them into the flow as one would a violent cadenza or a steady backing sound. She did this deftly, and the improvisation overall had a strong, episodic feeling, to the point that I thought it might have had a pre-arranged structure. But it was all improvised, with the group collectively steering the shifts in mood and intensity. It wasn’t always that way, Popejoy told us after the show. It just goes to show what can happen when a band plays together for a long time, developing an instinct for one another’s moves. The poems became a focal point, but Bernstein’s violin playing was terrific, too. (Turns out she plays in settings like Braxton ensembles.) At one point near the end, she sawed ferociously, fingers ratting up and down the neck, with the other two gradually building up until white-noise intensity. Another moment that stands out in memory is when Popejoy played with a fingerpicked guitar-like serenity, but with the bass producing a sound like shrieking steam. As for the poems themselves, there was one about conversation being an accident, something you always wish could be undone. Another was a word collage — “didactic,” “auto,” several others — echoed back. Bernstein would repeat the words at a different tempo so that the echoed loop brought up thewords at unpredictable, incongruous moments. Simple idea, but I liked the sound of it. The new Iron Dog album is called Interactive Album Rock, and it’s good. So, they’re on my map now, as is JACK.